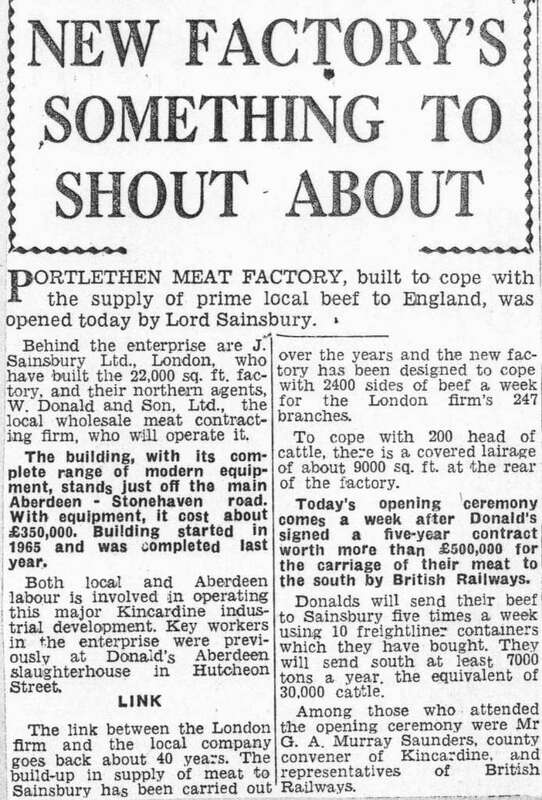 The Meat factory opens in 1967 - a couple of news articles. Apologies to all those at McIntosh Donald's Meat factory for including you in the "stinking" section but for a long time you have to admit the aroma created by the factory was less than pleasant. Thankfully, nowadays it isn't quite the same problem as it used to be (but we can still all detect a "niff"). The building of the factory began in 1965 and was completed in 1966 although it was the following year before it actually opened. The cost of the venture was around £350,000, which although doesn’t seem much by today’s standards, was a considerable sum for the mid 1960’s. 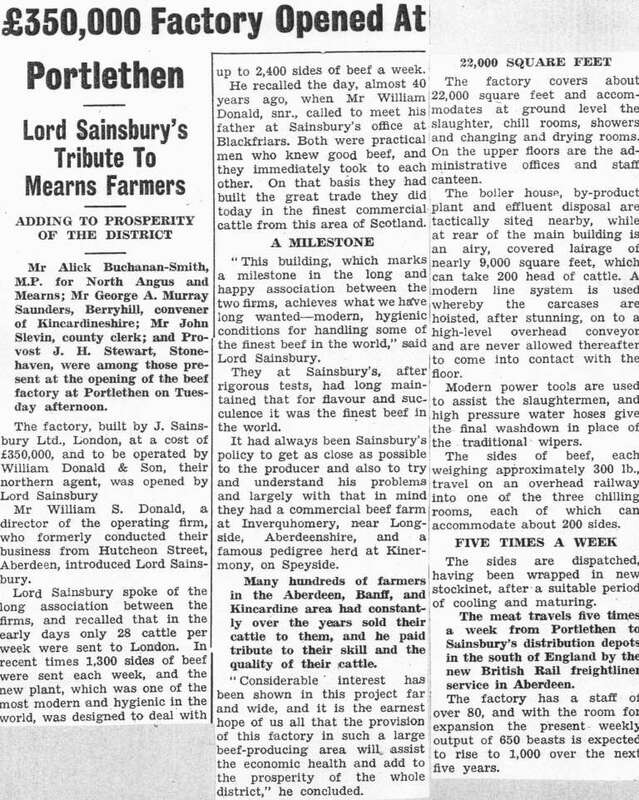 It was opened on Tuesday 6th June 1967 and in attendance were the Kincardineshire MP, Alick Buchanan Smith, owner Mr William S. Donald and Lord Sainsbury. The initial factory site covered 22,000 square feet and at ground level accommodated the slaughter and chill room, as well as showers and changing rooms. On the upper floors were the administrative offices and a staff canteen. The boiler house, by-product plant and effluent disposal system were tactically sited nearby and at the rear of the main building there was an airy, covered lairage of nearly 9,000 square feet which could accommodate up to 200 live animals. A line system was used to hoist the carcasses, after stunning, on to a high level conveyor which prevented them from coming into contact with the floor. Modern power tools were used to assist the slaughter men, and high pressure water hoses gave the final wash down in place of the more traditional wipers. The sides of beef, each weighing about 300 pounds, travelled on an overhead railway system into one of the three chilling rooms, each of which was able to accommodate about 200 sides. These sides were then dispatched after a suitable period of cooling and maturing. Originally these sides of beef were despatched five times a week from Portlethen to Sainsbury’s distribution points in the south of England via rail at first and then latterly by truck. Since those early days the factory has expanded again, equipment has been modernised and the output would have increased from the initial weekly targets of 1000 beasts weekly. Over the years the future of the factory has been called into question more than once but has always managed to survive having to relocate or shutdown altogether. Today the factory is still involved with slaughtering, processing and the wholesale trade in meat products and some years ago they added their own independent butcher’s shop to their site. 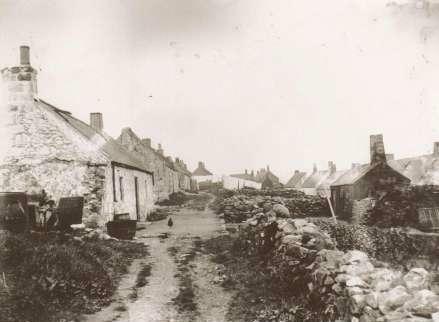 The meat factory was the first industry in Portlethen that offered multiple opportunities for the local workforce, and until the 1980’s was the sole major industry in the Portlethen area. Today Portlethen is the home for two industrial estates, also numerous large and small retail outlets and the local population (and those living beyond) are now well catered for in terms of job opportunities.